A brand new exhibition at Durham’s Palace Green Library has opened, which celebrates the history of the Durham Light Infantry. ‘Courage, Comrades, Community’ draws on the DLI Collection to examine the distinguished role of the regiment across 200 years of global conflict and highlights the special place that DLI soldiers have in the history of County Durham. Visitors will also be able to see objects and artefacts that have never been on display before, including the Lahore Trades Club, uniform and medals, as well as an engraved glass goblet dating back to the early 19th Century and a church window crafted by DLI soldiers overseas. 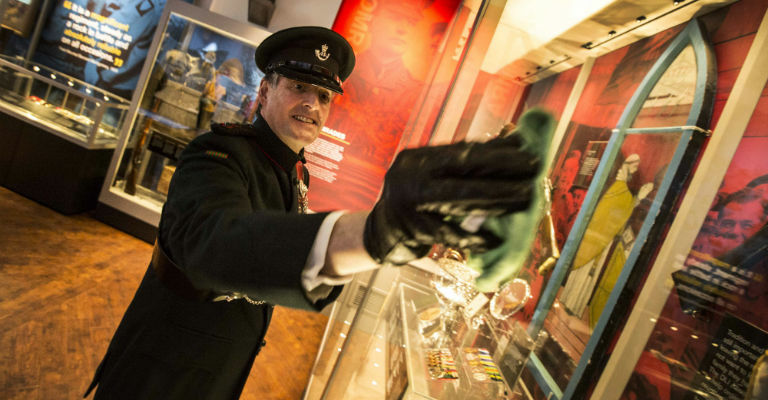 The chairman of the DLI Trustees, James Ramsbotham, said the new ‘Courage, Comrades, Community’ exhibition, would help ensure an “exciting future” for the collection and help to keep the memory of DLI soldiers alive for future generations. “Though the regiment no longer exists, having become the Light Infantry in 1968, then the Rifles in 2007, the DLI Collection is very highly respected and means so much to so many people, so we must ensure that the DLI story continues to be told,” he said. The new gallery has opened in partnership with Durham County Council, with Cllr Neil Foster, the council’s cabinet member for economic regeneration, arts and culture, saying: “This new, free gallery allows us to bring the stories of the Durham soldiers to the busy and historic heart of our city, making it easily accessible to the hundreds of thousands of people we attract each year. It enables us to showcase some items that have never been seen before, and – through interactive elements – means the voices of former servicemen can be heard. ‘Courage, Comrades, Community’ is now open at the Palace Green Library and is free to access and is open Tuesday to Sunday from 10am until 4.45pm and Mondays from noon until 4.45pm.